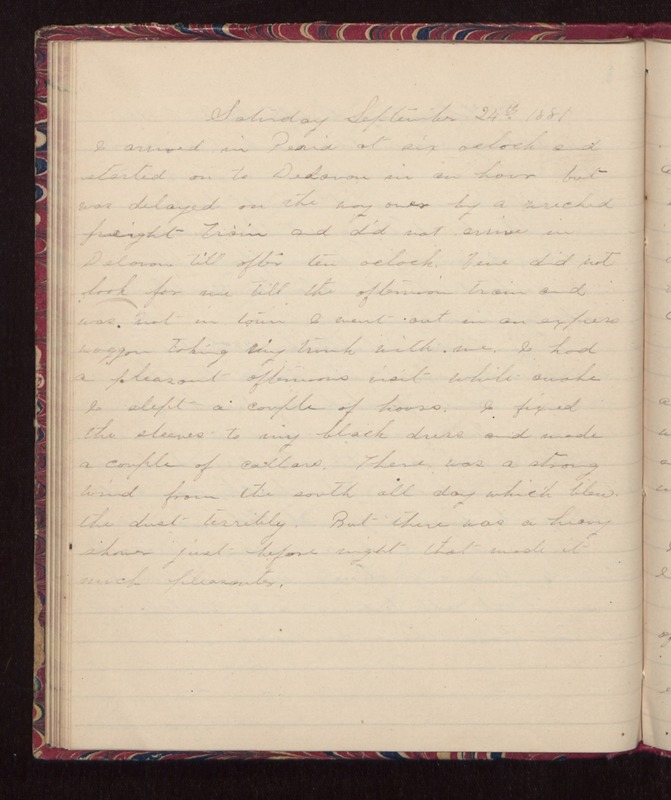 Saturday September 24th 1881 I arrived in Peoria at six oclock and started on to Delavan in an hour but was delayed on the way over by a wrecked freight train and did not arrive in Delavan till after ten oclock. Vene did not look for me till the afternoon train and was not in town I went out in an express waggon taking my trunk with me. I had a pleasant afternoons visit while awake I slept a couple of hours. I fixed the sleeves to my black dress and made a couple of collars. There was a strong wind from the south all day which blew the dust terribly. But there was a heavy shower just before night that made it much pleasanter.